1. We did not put 20% down. I know, I know. Dave Ramsey just set a flame to my blog. It was a bad choice. I totally had baby fever and thought I NEEDED a house or we couldn’t have a baby. That was silly. Babies don’t know where they live! 🙂 We did put about 7% down but that’s not a great excuse. When you don’t put 20% down and have a conventional mortgage, you’ll end up paying PMI, or Private Mortgage Insurance. Ours was about $70 a month. Luckily, we got smart about 2 years into living here and saved up enough to pay down the remaining amount so our loan to value ratio was 80% and the PMI dropped off. We figured that having $70 extra a month to put towards other things (i.e. having control of our own money) was better than paying some insurance company to protect our bank in the chance we defaulted. 2. We didn’t pay attention enough to old doors and an old porch. The one thing I wanted in a house was an older home with newer windows, paint, etc. We looked a quite a few older homes, but most of them were still in the age of grandma and we weren’t quite up to the task of stripping wallpaper, refinishing floors and the like. So when we found our house that had been flipped by someone, we were happy. Most of the cosmetic work was done and there were new windows, we just needed to add our own flavor. However, we didn’t pay enough attention to some of the bones. The side door was beginning to rot (it may have been the original 1920s door) and the porch was newly painted but also was looking a little rough. Replacing these things on an old home is not easy, because NOTHING is standard size. You can not walk in to Home Depot or Lowe’s and pick out a door and come home. Oh, no. The doors are skinnier and taller and require special order and special installation. In other words, it is not cheap (or quick!). Our front porch is going to be replaced next summer and that’s another massive job. If you want to stick with the 1920s style of the home you have to shell out the big bucks. I’m really excited to have a new porch, but I’m here to warn you to really inspect the little things because they can become the BIG things. 3. We didn’t consider our future family. Ok, so I just wrote a post about how my house isn’t too small so I’m not going to say that at all. Because we were planning on starting a family ASAP, here is what I wish I would have considered : A downstairs bathroom for pregnancy and potty training! A dishwasher! An attached garage (nearly non-existent in old homes though). These are definitely wants more than needs, but they also make a difference when you’re trying to sell the home. I guess we’ll find out someday. That’s my thoughts on home-buying for this week! Would you add anything? Something you did right or wrong? Maybe you jumped a little soon and didn’t put 20% down? Maybe you didn’t realize what a pain it would to trek up a flight of stairs to go to the bathroom? I’d love to hear! Next week I plan to talk about if buying a home is really worth it- or how long you should rent for! The answer may surprise you! Leah – Well written. I know your pain all to well. Old homes are great….at stealing your $$ away quickly. Like you said NOTHING is standard, because it was all built on site or to meet your homes plans. NO prefab here. You are blessed to be able to stay at home with the kiddos. I did too and regret NOTHING. I hope the boys look back on what they had not what they were missing. I am so blessed! And I’m sure the kids don’t even know that the porch boards are rotting or that the front door is seeping cold air! 🙂 For the charm you gain in an old home, you also gain lots of projects. 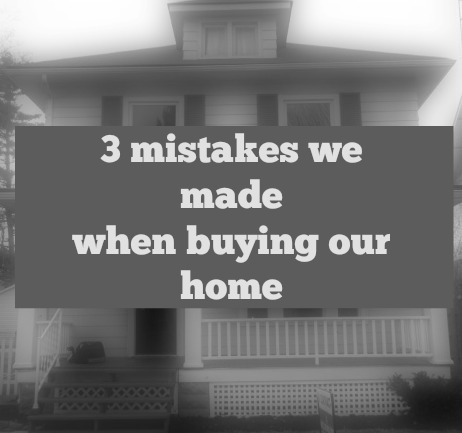 I know as a young first-time buyer we should have had someone walk through with us who had lived in an old home (i.e. maybe my parents?) so we realized all of the hard work we would encounter!